John van den Heuvel will give the final presentation of his MSc research Kite sailing - Improving system performance and safety on 24 August 2010. The presentation is open to the public and will take place at 15:00h in room A of the Aerospace Engineering Faculty of TU Delft. In the world of high performance sailing people are using state of the art technology to push the limits in speed and performance. The introduction of the sport kite surfing has shown the power that kites can generate. It has meant a revolution in the world of surfing. Kite surfing only exists since 15 years and began to expand around the world only since the year 2000. Already in 2008 the 50 knots speed sailing barrier has been broken by a kite surfer being the first sailing system to do so. This is less than ten years after the sport started to become public in the world. This illustrates the potential in performance for the use of kites. Kites also offer the possibility of a revolution in other fields like sailing where systems are currently developed to provide propulsion for commercial vessels to save fossil fuels. Kite systems are also developed for clean energy production where wind energy at high altitude is harvested. These HAWP systems can also be applied to ships offering the possibility of sailing at a course of 0 degrees iinto the wind on pure wind energy. The goal of this research is to evolve the kite system such that the performance and safety is increased for kitesailing and energy production. A sailing system in general is analyzed to determine the parameters that influence the sailing performance the most. 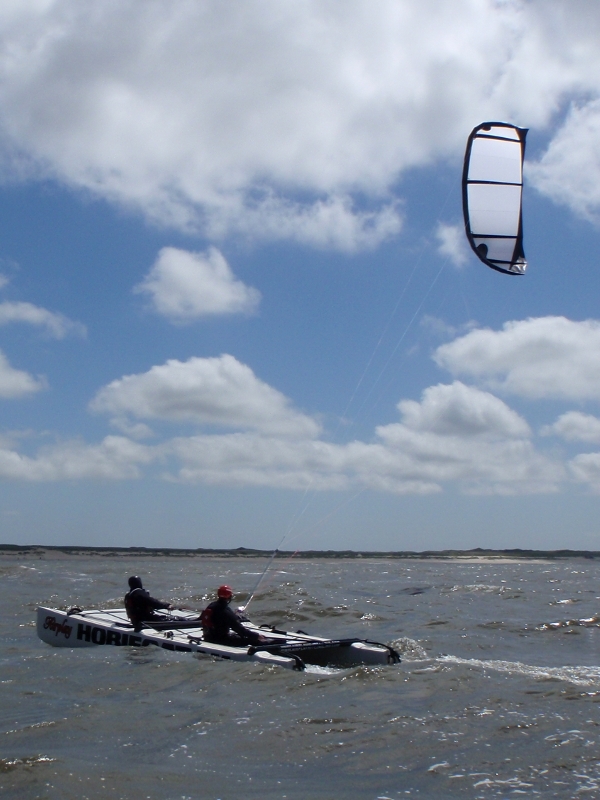 A 25m2 kite has been developed produced and tested during kite sailing. Also new bridles have been tested that give much more depower which increases the safety and tests have been performed on tube kites with revolutionary airfoil designs.